1. Introduction PLEASE DOES NOT USE THE WEBSITE IF YOU DO NOT AGREE WITH THESE TERMS AND CONDITIONS. 1.1 Please read these terms and conditions carefully before using the Chaidee Mansion and Hotel website (“http://www.chaidee-mansion.com/ ”) which is operated by 1hotelsolution.com Co., Ltd. By accessing or using the Website you agree to be legally bound by these terms and conditions as they may be modified and posted from time to time. 5.3 To the fullest extent permitted by applicable law, We accept no liability for any loss or damage of any nature whatsoever and howsoever arising out of or in connection with the viewing, use or performance of the Website or its contents whether due to inaccuracy, error, omission or any other cause and whether on the part of Casuarinas Jomtien Hotel or our servants, agents or any other person or entity. 6. Linked Sites We make no representations whatsoever about any other websites which you may access through the Website or which may link to the Website. 7. Availability of the Website We will try to make the Website available but cannot guarantee that the Website will operate continuously or without interruptions or be error free. 8.2 Any information provided by you in connection with any transaction regarding your credit or debit card numbers, expiry date and billing or delivery address will be used by Us, or by others on our behalf, to process the transaction. These details will be stored on a secure server and encrypted and may be used by Us to facilitate and personalize future transactions with you. 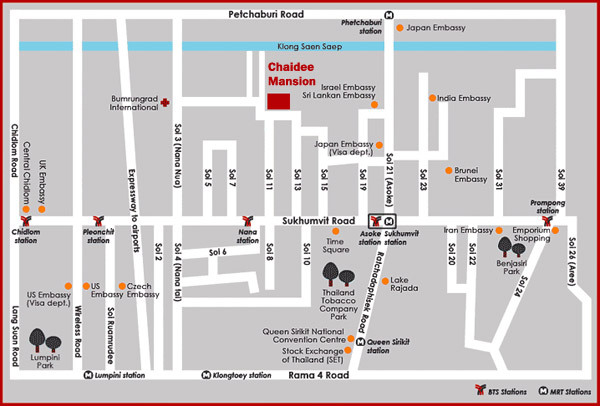 31/3-5 Chaidee Mansion, Sukhumvit Soi 11, North Klongtoey, Wattana District, Bangkok, 10110.